Also, their offering a pay whatever you want for Interplay games. GOG.com is having an offer of 60% off for these games from Anuman Interactive till the end of this weekend. GUYS! THQ is doing the "Humble Bundle" for charity! Last edited by willx; 2012-12-12 at 09:49. So, wanting to try Metro 2033, yet don't want to pay for it but don't want to be a pirate either? Facebook along with THQ is giving away free copies of the game! Just put a Like on the Facebook link, then get your serial code for the game under "Free Download". The key can be activated through the instructions on the page, or you can activate it via Steam. Offer lasts until December 16, so get it fast! On Flying: "For once you have tasted flight you will walk the earth with your eyes turned skywards, for there you have been and there you will long to return." Panzies, I bought this when it was 60 bucks > such a underrated game. 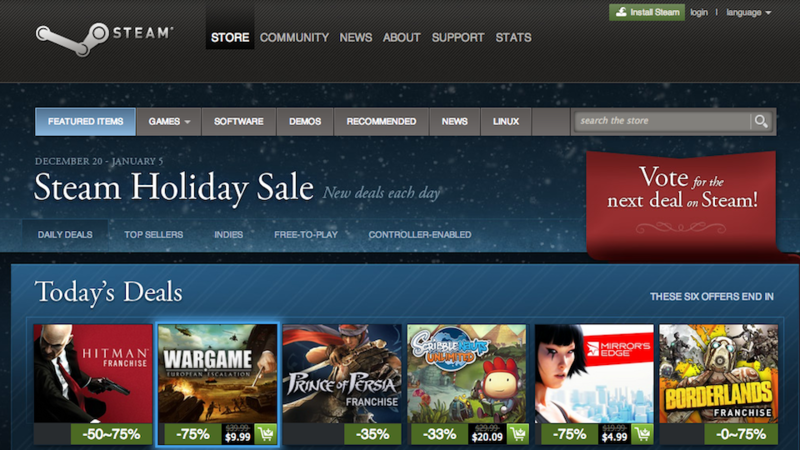 The Steam Holiday Sale has begun! If it's good, then it sure as hell advertises itself really well as the most generic shooter ever. FYI, you can buy Guild Wars 2 for 30% off at their main site only until February 25th. "Avoiding the truth but trying not to lie, and it's just terrible." "Caring may occur without curing, but curing cannot occur without caring." Pick 5 Games. Save 80%! Get Alan Wake:Collectors Edition and Alan Wake's American Nightmare on PC for $1 total for both of them. You'll need Steam. You can pay whatever you want for the two titles. The lowest you can go is $1.00. If you want both titles for $1, then select custom payment, type in $1.00, and then select on the sliding scale how you want to distribute the payment (I gave it all to Remedy, the developer). Pay, download the title, and make sure that you get your Steam key. I copy and pasted my Steam keys for both titles. GOG.com is having a Summer Sale special on all of their games with special offers for certain games everyday. The special will end on July 5th. Last edited by MrTerrorist; 2013-06-23 at 06:34. Not sure how long it's gonna last but I picked up mine (platform is for steam as well). It's $44 bucks for the game + the Greek City States DLC instead of $60. Quite a good steal. I highly doubt the steam summer sale will provide any discount close to that; 10% off at best, but definitely not 25% haha. Dust An Elysian Tail is 50% off. $7.49. No iframe support, please watch on YouTube. Also, Baldur's Gate 1 HD is 75% off. $4.99. Get both for less than $13. Just a reminder. In 22 hours, the GOG.comsummer sale will be over. So you better get those game bundles and special offers with discounts up to 85%, or pick your individual favorites from their catalog with 50% off discount. Just remember, you've only got time until Friday, July 5, at 12:59PM GMT. So much for being a few hours =/. Gosh, I've been freaking waiting for the sale. I'm dying to pick up the Dragonborn DLC for Skyrim forever (planning on starting a whole new character with graphical mods and balanced fighting/gear mods). All times are GMT -5. The time now is 17:19.